Wash the sweet potatoes and pat them dry. bake for 50 to 60 minutes, or until they give a little when gently squeezed. Remove from the oven and cool slightly. While the potatoes are baking, cook the sausage in a skillet over medium-high heat, breaking it up with a wooden spoon, until it is no longer pink in the center. Remove with a slotted spoon to a paperP towel lined plate and discard all but a tablespoon or two of the fat. Lower the heat under the skillet to medium low. Whisk the eggs in a bowl; cook in the fat from the sausage until softly scrambled and fluffy. Cut the sweet potatoes in half lengthwise and carefully scoop out the flesh into a large mixing bowl, reserving the skins; lightly season with salt and pepper. Gently stir in the sausage, and scrambled eggs until well-mixed. 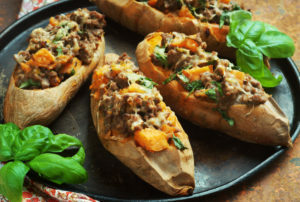 Spoon the mixture back into the reserved sweet potato skins and transfer to a rimmed baking sheet. Return to the oven and bake at 350 F for 10 to 15 minutes, or until the potatoes are heated through. Serve with salsa, if desired.